Sustainability does not stop at the property line. We are a part of the wider world and our gardens do impact that world. Done badly, gardening can be detrimental to the wider world. So when it comes to the world beyond the garden fence, the first rule is ‘Do No Harm‘. In other words: Don’t mess up your nest. But we can go well beyond merely not harming the world in which we live. There are many ways that our gardening endeavors can be a positive force, both in our communities and for the wider environment. Done right, tending a garden can be a real force for good in the wider world. When you support your local nurseries and garden centers, your money is reinvested in your community AND you get fresher plants. Garden clubs create beauty in our down-towns, tending window-boxes and mini-parks. Master gardeners pass on their gardening knowledge to old and young alike. A local nursery, Cady’s Falls, in Morrisville, Vermont, sells a wonderful array of plants, almost all of which they grow themselves. I like to buy plants that are both sold by local nurseries, and also grown locally. I will ask questions such as ‘Where were these plants grown?’ And sometimes the answer is surprising. 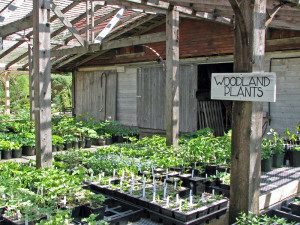 Many local nurseries grow their own plants or perhaps they buy them from a local grower. These are the nurseries that will get my gardening dollar. But a nursery that ships in many of its plants from across the continent can hardly be considered environmentally friendly, and unless it is positively the only source for something extremely special, I will avoid spending my money on plants shipped from afar. As more and more habitat is lost to human development, our gardens become havens for wildlife, oases in the tarmac. So, as a start, leave those perennials standing during the winter. Not only do they look nice in the snow, but their seeds are food for birds during the colder months. Groups of shrubs create both food and nesting cover for songbirds and small mammals. For more ideas check out the National Wildlife Federation website for ways to create a wildlife-friendly garden and submit your garden to become a Certified Backyard habitat. It is a fact of life, and unlikely to change any time soon, that in the wake of suburban development fields and forest are disappearing everywhere. And this change is having a profound effect on how rainwater is caught and dispersed into our streams and rivers. The soil in forests and fields acts like a giant sponge,and in all but the heaviest storm it entirely absorbs the rainwater. At the same time, the tangled web of plant roots prevents the soil from eroding and washing away. The trapped water trickles down through the layers of soil, which act like a big filter, trapping pollutants (think how your coffee filter works!). Eventually it joins the ‘groundwater’ and is G-R-A-D-U-A-L-L-Y released into the streams and rivers. Now consider what happens as the land-use patterns change and ‘development’ arrives. Part of the absorbent spongy soil is replaced by impervious surfaces; roofs, blacktop driveways and roadways. Compaction from construction further diminishes the capacity of the remaining soil to absorb rainwater. Now even in a small storm, the rain gushes across these hard surfaces, straight into the storm sewers, quickly swelling our steams and rivers to flood levels. At the same time this fast moving water picks up pollutants like motor oil from the hard surfaces, and this also goes directly into our waterways. One solution is to install a rain garden. This is a is a pretty term to describe a concave depression with sloping sides that will hold excess rainwater so that it can gradually be absorbed by the soil, instead having it head straight for the nearest storm sewer. The rain garden is positioned where run-off will naturally flow, for example a low-spot that can receive water from the roof via a down-spout (but away from the house foundation), or a low-spot at the corner of the driveway. The rain garden sized to be able to hold all the water from that surface in a typical rainstorm. Plants are added which tolerate very wet feet after a rainstorm, but otherwise normal-to-dry conditions. If you are installing a new driveway, consider permeable pavers in place of traditional ‘blacktop’. Permeable pavers, either metal mesh or concrete, create a grid-like surface that allows water to be absorbed directly into the ground across the entire area. You can even plant grass or a ground-cover like creeping thyme between the pavers, for an attractive pattern. Phosphorous run-off from lawn fertilizers (not to mention from farming activities) is a major cause of pollution and undesirable algae bloom in our lakes. So switching to an organic lawn, counts as both ‘easy on the gardener, AND ‘gentle on the earth‘. Plastic pots are convenient for the grower and the nurseries, so that is how you usually find perennials and shrubs potted for sale. Cady’s Falls Nursery welcomes recycled pots here! However they are also robust enough to be reused many times over. Many nurseries happily take recycled pots. So it is up to us gardeners to ensure our ‘black pots’ make it back to a nursery that will take them in. Often this is one more reason to support a local business that is committed to recycling. And next spring, when you are out shopping for veggie starts, instead of buying them in those plastic six-packs, look for plants grown in biodegradable pots like peat pots or Cowpots. If plastic is the only option, then hold onto those pots for starting your own seeds in the future. I have already mentioned the value of newspaper under hay in the vegetable garden. It can also be used in our ornamental gardens, in combination with bark mulch. A few layers of newsprint spread under the mulch will halve the amount of mulch required. Almost everyone by now is aware of the problem with invasive species escaping into the wild and colonizing large tracts of land. Often these species, like ‘burning bush’, started out as popular garden plants promoted and sold by nurseries and garden centers everywhere. As their thuggish tendencies have become apparent, individual states have responded by creating lists of invasive plants whose sale is forbidden. The problem is that the invasive lists vary over time as well as from state to state. Sometimes there are good reasons behind this variability. Horticulturists only find out gradually and by observation what happens as a plant escapes into the wild; not all non-natives will aggressively take over the natural environment. On the other hand, some plants, such as Miscanthus, are designated ‘invasive’ where in places they can set seed and sprout in a season, and spread ‘like wildfire’. This typically happens in parts of the country where the winters are warm, but not up here in Vermont (at least not yet, but who knows how this will play out as climate change takes effect). Many state-to-state differences arise because some states are simply more careful than others. So the message is for gardeners to take the threat of invasive species over-running our natural environments seriously. Find out what is forbidden in your state, and in neighboring states, as well as species that may be struck down in the future, and avoid these plants at the garden center. You may even need to check what is already growing in your garden right now, and decide to remove a plant you purchased ten years ago in complete innocence. How does my garden impact the wider world?? Do I have any invasive species growing in the garden? Can I reduce chemical pollution and rain-water run-off? Does my garden welcome wildlife? How can my gardening contribute to my community? 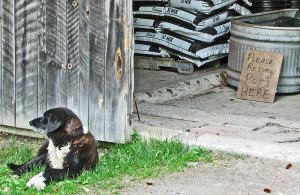 How can I reduce my use of non-renewable resources in my garden?